Nylon Backpacks fined extensive applications for storing and protecting clothes and books in any weather condition. We fabricate this backpack using optimum quality raw materials are known for their lightweight and strong carrying capacity. 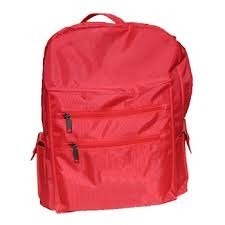 These backpacks are available in different sizes and specifications and can be customized as per the clients’ requirements. These products clients can avail from us these products at reasonable price. Isra Trading Corporation commenced in the year 1999 as a Partnership based firm. We have located our mainstay at Chennai, Tamil Nadu (India). We are betrothed in manufacturing, supplying, wholesaling, dealing and retailing wide range of bags that include Executive Bag, Laptop Bag, Trolley Bag, Travel Bag, Sling Bag, Shoulder Bag, Body Bag, Fancy Carry Bag, Casual Carry Bag and many more.